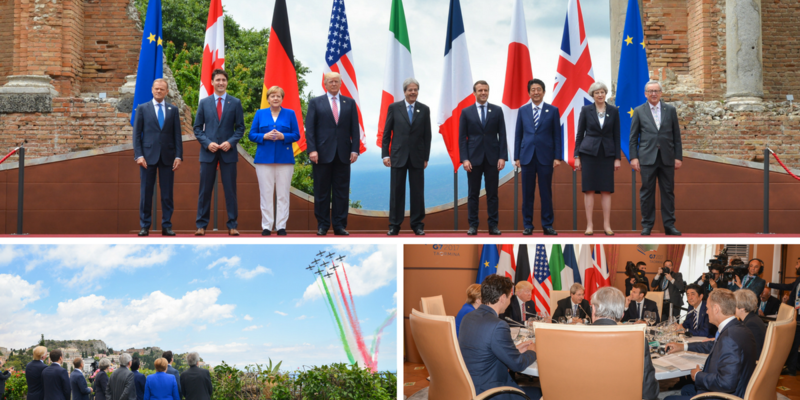 The Taormina Summit, the main event of the Italian G7 Presidency, started today. The opening ceremony was held at 11:30 this morning, at the renowned Greek Theater. Prime Minister Paolo Gentiloni welcomed Justin Trudeau, Prime Minister of Canada, Emmanuel Macron, President of France, Angela Merkel, Chancellor of Germany, Shinzo Abe, Prime Minister of Japan, Theresa May, Prime Minister of the United Kingdom, Donald Trump, President of the United States, Jean-Claude Juncker, President of the EU Commission and Donald Tusk, President of the European Council. Following the traditional family photo, the Frecce Tricolori – the acrobatic team of Italy’s Air Force – flew over, by way of greeting. The first sessions began immediately following the ceremony and will go on throughout the afternoon. This evening there will be a concert of the Scala Philharmonic Orchestra at the Greek Theater, and then a gala dinner, hosted by the President of the Italian Republic, Sergio Mattarella.